It is the end of the year and time to thank the important people in your child's life. But not just your child, your students' lives too. 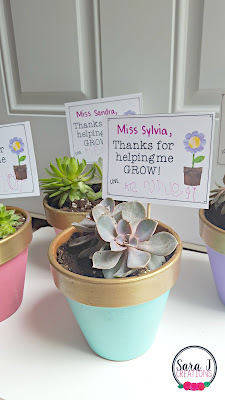 I have an easy thank you gift that I used for my daughter's teachers but these would also be perfect for anyone who helps support your classroom as well - support staff, volunteers, office staff, specials teachers, etc. I've included "Thanks for helping me grow" and "Thanks for helping us grow" tags. Click HERE to read the tutorial and grab your gift tags.